After decades of hearing these sorts of remarks, some of it sunk in. Some of it she began to believe might be true. Some of it made her question herself and her sanity. Since the divorce, he’s moved on, found a new girlfriend and they’re building a house together. She was feeling stuck in the past with her fearful mind telling her that this new woman is able to make him happy in ways that I clearly could not. I love diving into the deep end and swimming around in the soul work that creates meaningful change; so in we went. Think of a time when someone you know, maybe a friend of a co-worker, gave you some feedback about how you could have handled a situation differently or how you could improve in some way. You can receive that because you know there’s some truth there. But when someone tells you that you’re controlling and out of control, when you know deep down you’re not, he’s telling you his story. When your husband says you’re a tortured soul and difficult to be around and it doesn’t land with you, he’s telling you his story. His story…about how he’s actually incredibly controlling but doesn’t like that part of himself. His story…about how he feels out of control, but would rather turn that spotlight on you than on himself. His story…about how he feels like a tortured soul who knows he’s difficult to be around, but doesn’t have the courage to look within and heal himself. When someone gives you feedback, if you check in with your body – right then and there – you know if there’s some truth there or not. Truth literally feels different in our bodies. You know if this is something you should pay attention to for yourself or if they’re simply telling you their story, projecting onto you all the things they cannot own for themselves. If someone’s been telling you their story, you don’t have to pick it up, put it in your backpack and carry it with you for the rest of your life. You don’t have to take it on, question yourself, and allow it to keep you stuck. You can just recognize it as their story, and let it just lie there. 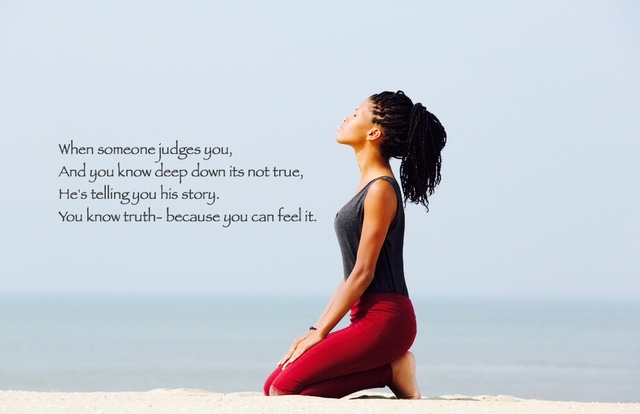 Because you know the truth of who you are. You know…because you can feel it.